Polished Dreams: Happee Birthdae Lea! Hi guys! Once again it's been a little while, I'm really sorry. Going back to uni has been harder than I thought but I think I've finally figured out a way I can balance everything. The only problem is my plan then gets ruined whenever I go home for the weekend so I can't say how well it's going to work haha! Today's nails have actually already been posted on Instagram but I was pretty pleased with these and they were for a very special person so here we are. 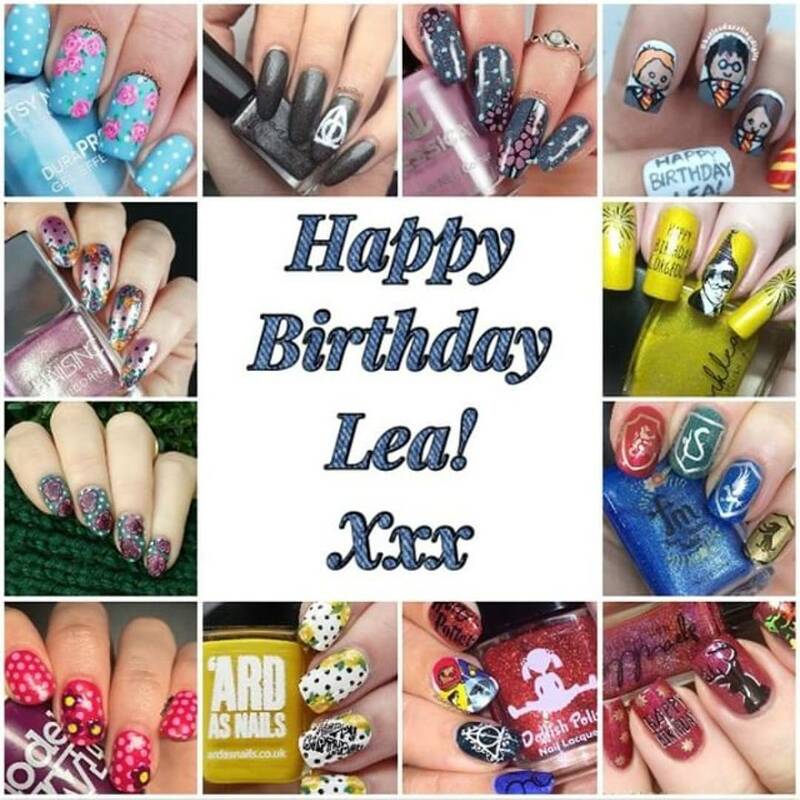 Last week was one of my BFF's birthday - Lea from Leasnails and Sparklea Nail Polish! I was invited to join a birthday collab for her and how could I possibly refuse? I started with a base of 'White Van Girl' from 'Ard As Nails and used a small dotting tool to do dots with 'Beauty', also from 'Ard As Nails. 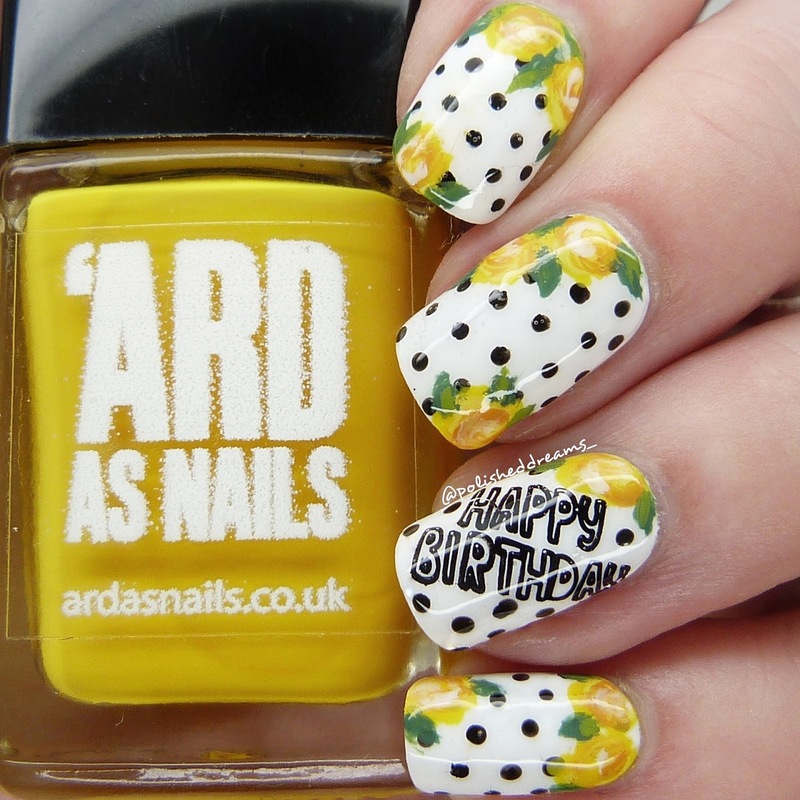 For the flowers I used 'Ard As Nails 'Banana Smoothie' (which is the gorgeous bright yellow I'm holding) and 'Daisy' and Barry M 'Mustard'. The leaves were painted with with Barry M 'Cardamom' and 'Ard As Nails 'Dew Drop'. My chosen brush for all these small details was the Whats Up Nails 'Pure Color 10 Detail Brush'. 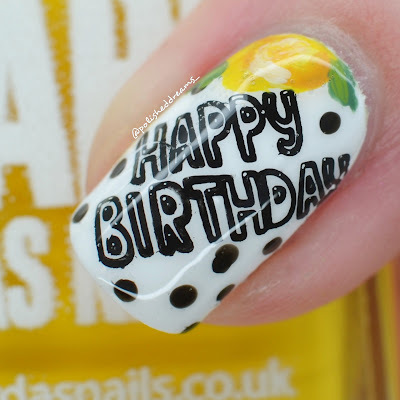 It's safe to say I did not paint the "Happy Birthday" on my ring finger but instead used the fab 'Party Time' plate from UberChic Beauty (I got mine from Nail Art UK). Finish off with a coat of topcoat and we're all done! As I said at the beginning I really loved this mani...right up until I discovered people thought the flowers were lemons! Admittedly I can see where they're coming from but I did my best okay? Perhaps I just need more practice... Saying that, I've got another special dots and florals mani planned so keep your eyes peeled. Also it was just luck that I happened to wearing this beautiful yellow jumper when doing these nails so I couldn't resist snapping a matchy matchy shot! 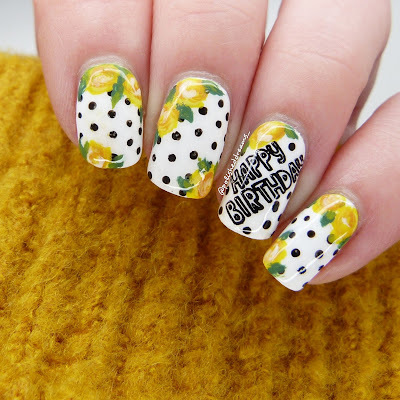 Hopefully it was nice having a bit of nail art on the blog for the first time in a while, I do really love doing it. I've got a few new polish collections I need to work my way through and do swatches for but hopefully it won't be too long before I'm getting arty again!